This morning HTC announced its 7-inch Flyer tablet, and unlike the hoards of Android tablets we've seen in the last couple of months, it's got something that frankly reminds us a bit of Microsoft's original tablet push... a stylus! The Flyer doesn't come with just any old capacitive stylus, however -- HTC has worked with N-Trig, the company that has made digitizers for convertible PCs like the Dell Latitude XT, to implement a much more accurate writing or doodling experience. And well, it basically makes it unlike any other Android tablet on the market right now. We spent some time with N-Trig and the Flyer today, focusing quite a bit on the new stylus and "Scribe" software, as HTC calls it -- hit the break for some details on both the software and hardware and a short video of how that pen actually works when put to the screen. All those logistics aside, the true beauty of a solution like this is how it blends the responsiveness of regular finger input with an extremely accurate inking one. You'd think the screen was your typical capacitive screen, until you put the stylus to it. Unlike capacitive styli, you don't have to press extremely hard or worry about totally missing your on-screen target. And not to worry, N-Trig says the AAAA battery-powered pen battery should last about a year and a half -- so you'll have a bit of time before you have to run out to the drugstore and pick up a new pack of Energizers. But a tablet's hardware is only as good as its software, right? Well, considering Android was built primarily around finger input, the stylus certainly adds a new (and rather unexpected) dimension to Google's mobile OS, which is why HTC's focused quite a bit on adding some pen-based applications. We don't know about you, but we've never really wanted to use a stylus to select applications or add widgets. 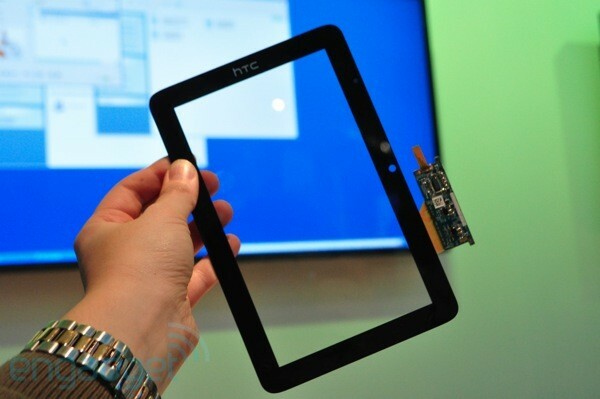 That said, HTC seems to be off to a decent start in terms of developing software on top of Android 2.2. Anywhere within the OS, you can tap the pen on the screen to take a screenshot and then instantaneously start writing or doodling over that image. You can then easily share it out via e-mail, etc. It's also designed a Notes application that integrates with Evernote. You can take notes, change the color of the ink, etc. Additionally, you can scribble over images in the image gallery. In action all those things worked quite well, especially for its beta status. 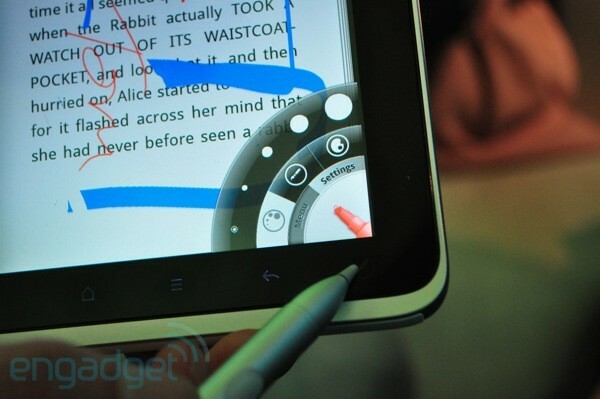 You will also be able to use the top button on the pen to select text and the button to erase. That's really all there is at the moment in terms of software -- or, at least, that's all HTC is demoing. We'd certainly like to see much more, including some sort of OCR software -- you know, the stuff that converts writing to editable text. Undoubtedly, that would make a ton of sense and be a great keyboard alternative on a tablet like this. It's really too early to make a call on what HTC is doing with the stylus and Scribe -- it's certainly unique and it seems like a very useful solution for those that love to take notes with a physical pen. Ultimately, however, our concerns are centered around the fact that Android was built around a finger and that virtually no apps out there right now take advantage of the pen input. However, if HTC can manage to build out the inking software experience and integrate it throughout the OS, we're sure those who still believe in the power of the pen and want to use a tablet as a content creation device will be all over this.